Solid State 600 Watt Amplifier Covers 160-6 Meters Transformer Power Supply 32 lbs. New! 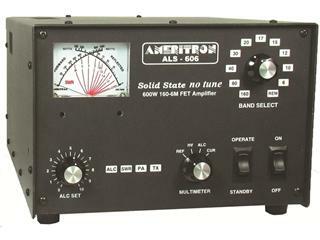 Ameritron ALS-606S/ALS-606 Solid State 600 Watt amplifier covers 160-6 Meters (no mod required) and automatically bandswitches by your transceiver. It’s only 4 dB below 1500 Watts -- less than an S-unit -- nobody can hear the difference! Be Heard! Work DX and ragchew with anyone. Just turn on, select band on your transceiver and operate. No tubes, no warming up, no tuning, ever. Desktop Size: 93/4Wx7Hx141/2D”, just 14.2 pounds. SWR/thermal protected: extremely quiet, lighted peak reading Cross-Needle SWR/Wattmeter, front panel ALC control, operate/standby switch, multimeter. Includes Transformer Power Supply for 120/220 VAC, 32 lbs., 91/2Wx6Hx12D inches.